Explore Bergen: Visit this storybook village that was the inspiration for the kingdom of Arendelle, home to Anna and her sister Elsa in Disney's animated movie Frozen. Be sure to get a glimpse of life in the 14th-century with a visit to the Bryggen district! Journey through Fjord Country: Discover diverse landscapes ranging from beautiful island coastlines to snow-capped mountains, Explore Western Norway's best known fjords, including Geirangerfjord and Naeroyfjord—both UNESCO World Heritage Sites. Meet local storytellers, fishermen and farmers. River Rafting Experience: Float along the pristine waters of one of Norway's breathtaking rivers as it carries you past gorgeous Norwegian landscapes, with professional local guides providing a wonderful experience for Adventurers of all ages. Learn Norwegian Folk Dancing: Take part in the rich history of one of the region's most beloved pastimes—folk dancing. Whirl around like Anna in Disney's Frozen and feel like a local from Arendelle! Trout Fishing Amid Glaciers: Float on the glacial blue waters of Lake Loen for a net fishing experience and catch some trout! Visit Stave Churches: Get a close-up look at these wooden masterpieces that remain an important part of Norway's heritage as well as its contribution to the history of world architecture. The unique stave-style also served as the inspiration for much of architecture in the classic Disney movie Frozen. No reviews yet for this trip. Browse other reviews below for Adventures by Disney. Velkommen til Norge! Once you exit customs and the baggage claim area, an Adventures by Disney representative welcomes you and assists you with your luggage before you are driven to the Radisson Blu Royal Hotel in Bergen. As your Adventure Guides check you in, explore this luxury hotel that sits in the heart of the historic Bryggen area, a UNESCO World Heritage Site that exemplifies Old-World charm. Join your fellow Adventurers for a delicious welcome dinner. Feel the excitement build as your Adventure Guides set the stage for the adventures that await you and your family —inspired by the Disney movie Frozen. Fuel up with a tasty breakfast at the hotel before departing for a day of adventure in Voss, known as "the adventure capital of Norway." Experience true serenity as you and your family glide along one of the area's rivers that offer stunning vistas of the region's mountains. Enjoy a post-rafting lunch at the Voss Rafting Center's grass-roofed cabin. Satisfy your appetite and prepare for your ride to Flåm. Enjoy a mouth-watering meal at the grill of this welcoming hotel. Enjoy a filling breakfast before you begin your day. Embark on an aquatic odyssey that will take you and your family on both a boat adventure and a cultural exploration. Ride an RIB into the nooks and crannies of the fjord. Discover villages along the way where you can experience Norwegian culture and enjoy the tales of local storytellers. And be sure to keep an eye out for trolls! Visit the smallest stave church in the world! Be hosted by a local expert who will tell you the history of this mid-12th-century, 40-seat church. Regale in tales of trolls and Norwegian legends from a local storyteller as you enjoy lunch at a quaint café. Also, get a lesson in cheese-making traditions and methods followed by a tasting of some regional favorites! Hop back on your RIB Boat and continue your journey along the scenic fjord amid stunning surroundings. Keep your eyes peeled…While sightings are rare, you may see a seal or a dolphin frolicking in the calm waters of the famed UNESCO World Heritage Site called Naeroyfjord. Your local expert will also point out an ancient Viking burial site. Have a pleasant meal abounding with local flavors. Discuss your day's adventures with family and newfound friends. Be sure to get some dining recommendations from your Adventure Guides. If you would like to take an evening walk, meet behind the hotel and head out on foot for a delightful, nighttime walking tour of local Flåm culture. Enjoy breakfast at the hotel before departing for your next destination—the famed Borgund Stave Church. Arrive in Laerdal and explore this remarkably well preserved stave church, built around 1180 A.D. Considered one of Norway's iconic structures, a stave church is a medieval wooden church built around 4 central upright logs with vertical planks for its walls. With beautifully carved portals and 4 carved dragon heads on the roof peaks, it's a sight to behold. The Borgund Stave Church may look familiar, as it along with other stave churches provided architectural inspiration to the filmmakers of the classic Disney film Frozen. Before heading out for Geiranger, delight in a delectable Norwegian lunch at a local restaurant nestled among the fjords and glaciers. 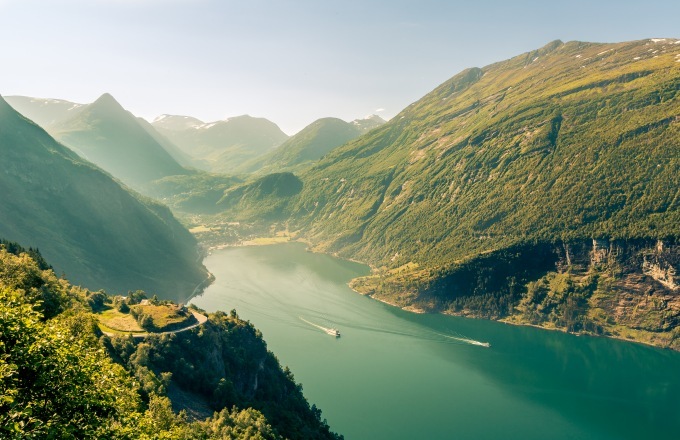 Enjoy gorgeous landscapes dotted with pastoral farmland as you travel to Geiranger, the location of some of the most spectacular scenery in the world. The Geirangerfjord area—a UNESCO World Heritage Site—is a popular destination and home to the majestic Seven Sisters Waterfall which overlooks Geirangerfjord. As your Adventure Guides check you in, explore this historic, family-run hotel on the hill above Geiranger that offers breathtaking views of the Geirangerfjord and superb amenities including indoor and outdoor swimming pools, Turkish baths, gardens and more. Savor a sampling of local flavors in the hotel's main dining room and share stories with fellow Adventurers while Junior Adventurers enjoy their own dinner and fun. Junior Adventurers can dine in a private setting in the hotel's "car garage," a museum that showcases an impressive collection of car-related treasures and whimsical memorabilia. Afterward, they can enjoy a troll-making activity and karaoke sing-along! Get your day off to a good start with a delightful breakfast. Take a refreshing hike up the hills and down into the dales around Westeras Farm. Experience some of the day-to-day rituals of life on this quaint farm. Listen to a Norwegian family's stories about the farming culture. And spend some quality time with the farm's animals, including goats and llamas! With a local farmer as your guide, walk from Westeras Farm to enjoy stunning views of Geirangerfjord, a UNESCO World Heritage Site. Satisfy your appetite with some wonderful home-style cooking featuring local ingredients and flavors. Take to the trails again—this time on a hike from the farm up to the glorious Storseterfossen Waterfall for a magnificent view of this natural wonder. Choose how to spend your afternoon. Visit the Geiranger Fjord Center* to gain some insight about the people and culture of the Geiranger region. Or go kayaking*, enjoy the services at the hotel including a spa treatment*, or simply curl up with a book by the pool and relax. Sit down for a Norwegian-style barbecue dinner in the hotel's grass-roofed, traditional cabin. Adventurers can watch as the chefs prepare their delicious, mouth-watering meal. Start your day with a delicious breakfast and then head for Lake Loen. Spend some relaxing time on Lake Loen either fishing for rainbow trout or just rowing across the serene, crystal-clear waters for a lazy morning with some of the most gorgeous vistas in the world. Journey into the peaceful Kjenndal Valley and enjoy a meal of traditional Norwegian food at this family-owned café. Choose from a menu that includes local fare like fresh trout or a gourmet burger. Catch a ride up this renowned glacier part way by "troll-car" and the last mile by foot. Along the way, be surrounded by cascading waterfalls and high mountain peaks, with Briksdal Glacier just up ahead. Also, enjoy a private Glacier Safari, which includes rafting on the lake in Jostedalsbreen National Park that is home to the world-famous glacier. Finally, return to Geiranger on a scenic ferry tour that includes a stunning photo op with the Seven Sisters waterfall as the backdrop. Dine on delicious traditional food at a cozy café or enjoy a more sophisticated dining experience at the hotel. Be sure to get a dining recommendation from your Adventure Guides. Enjoy a delicious breakfast at the hotel before you catch the train to Oslo. Travel by motor coach from Geiranger to Otta and board the train that will take you to the vibrant and sophisticated Norwegian capital of Oslo. Enjoy lunch on your own aboard the train while traveling through the scenic Norwegian countryside. Celebrate the culmination of an amazing family adventure with new friends and fellow Adventurers at this farewell dinner in a private room at the Grand Hotel Oslo. Enjoy entertainment by authentic folk dancers accompanied by a musician—and discover some of this nation's rich culture and history. Wake up to a hearty breakfast at the hotel and get ready for your flight home. Get assistance with your luggage and enjoy pre-arranged transportation to the airport. Then it's time to say "farvel" to Norway—until you return again! The cancellation fees set forth above shall apply irrespective of resale by us. In addition to the cancellation fees stated above, the cancellation fees that will apply if you cancel a pre- or post-stay hotel night booked through us (please see Arrive Early or Stay Late below) will follow the schedule above for cancelled vacation packages: 119-90 days: 50% of the total hotel cost for all nights reserved; 89-46 days: 75% of the total hotel cost for all nights reserved; 45 days or less: 100% of the total hotel cost for all nights reserved. Notwithstanding the above cancellation fee schedule, regardless of when you book, the Deposit is refundable for 14 calendar days after original booking. Cancellation policy for group travel may vary. Please contact your travel agent for complete details. The cancellation terms above apply only to the vacation package price and pre-/post-stay hotel night add-ons, and exclude, among other things, cancellation charges from air carriers. Please see Vacation Protection Plan and Adventure Travel Agreement, below. For reservations made prior to January 1, 2016, the cancellation fees assessed will be based on the cancellation fees listed on the original Guest Confirmation unless the vacation commencement date or the chosen vacation package is modified or a new Guest is added to the reservation.